Very symmetrical and well made. A perfect graduation gift for my daughter. Chain is thin but very strong and elegant. The pearls colors were perfect and matched each other perfectly This user was entered into a sweepstakes after submitting their honest review. DaVonna 14kw Gold Freshwater Pearl and .03 CTTW Diamond Earrings Pendant Necklace Jewelry Set 18"
DaVonna 14k White Gold White Akoya Pearl and .03 CTTW Diamond Stud Earrings Chain Pendant Necklace Jewelry Set 18"
DaVonna 14k Gold White Akoya Pearl and .09 CTTW Diamond Stud Earrings Pendant Necklace Jewelry Set 18"
DaVonna 14k White Gold Round White Freshwater Pearl Leverback Dangle Earring. These Pendant Necklace and stud earrings are classy and refined for even the most petite of ladies. Pendant are securely mounted to 14K White Gold rolo chain necklace is crafted of solid 14k gold and measures 18 inches. The stud earrings are secured with a butterfly friction post, designed to comfortably fit. 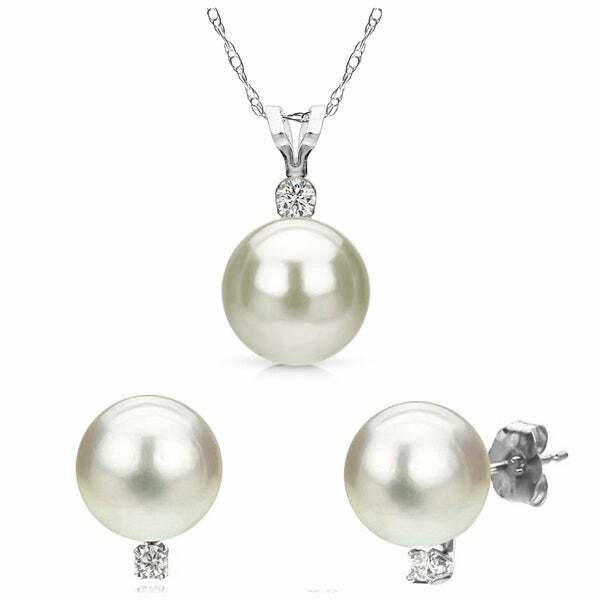 The earrings and necklace are accented with a .03 CTTW diamond that sits above the freshwater pearl for a bit of sparkle. A perfect gift for your mom, spouse, sister, best friend, for Back to School, Holiday, Birthday and Wedding opportunities. This just might be the most sophisticated and remarkable presents you may select! These pearls will be appreciated and cherished for many years to come. Dimensions 18.0 In. X 2.0 In. X 2.0 In. How to Clean Earrings from Overstock.com. Our guides provide customers with information about how to clean earrings. Best Benefits of Leverback Earrings from Overstock.com. Our guides provide customers with information about the benefits of leverback earrings. Tips on Different Types of Earring Clasps from Overstock.com. Our guides provide customers with tips on different types of earring clasps.